X-rays diffract from the periodic regular array of unit cells in a crystal to produce a pattern of diffraction spots [A]. X-ray waves reflecting from successive planes need to be a whole number of wavelengths out of step in order to produce a diffraction spot [C]. Symmetries and regularities in the pattern help the crystallographer to decide which type of unit cell is present. For instance the diffraction pattern in [A] shows hexagonal symmetry, so a unit cell such as those in [B] cannot be present. From the relative intensities of the spots and their phases one can calculate the crystal structure. 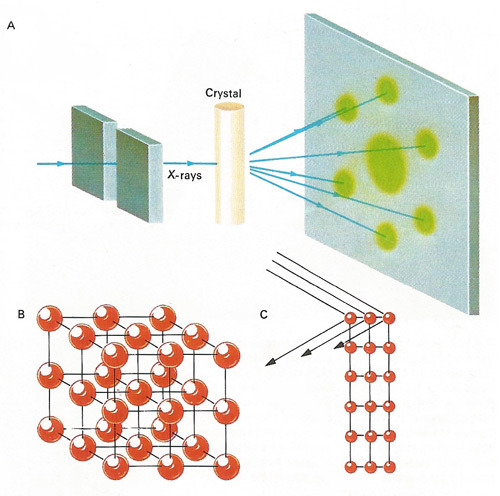 X-ray diffraction is the diffraction of X-rays by the atoms or ions of a crystal, according to a characteristic pattern that enables information to be obtained on the structure of the crystal. X-ray diffraction was discovered by Max von Laue (1912) and developed for crystal analysis (X-ray crystallography) by William Henry and William Lawrence Bragg (1912–13). The atomic nuclei in a crystal lattice act as diffraction gratings; the planes of atoms have spacings of a few angstrom units, which are comparable with the wavelengths of X-rays. Strong scattering of the rays by the crystal therefore occurs in certain directions, according to Bragg's law. Various techniques are available for applying X-ray diffraction to the study of single crystals, powders, fibers, etc., and by computation it is possible to work out three-dimensional electron density maps of the solid lattice from the recorded X-ray patterns.